Stone Soup for Five: What does your brave look like? What does your brave look like? My brave starts at 4:46 in the morning and I'm groggily working on my first cup of coffee. Spell check is so helpful at the 4am hour. Sweat pants, old slippers and coffee. No one is up but the birds, who are singing, already hopeful at the pale light promising another day. For me it's only going to happen before dawn. This is the only hour or two of time when no one needs me. Where I can concentrate and think without constant interruption. This is the hour I hate telling everyone about. When I get those crazy looks for getting up this early when I don't have a boss/job forcing me to. I get up this early because I have to write. Sadly, for me, writing is not about coffee shops, laptops, or a peaceful mountain cabin with a great view. Writing, here, in this house, is about getting up at the 4 o'clock hour. And working furiously before anyone wakes up. Even when I don't feel like it. Even when I don't have the words and everything I write is crap. It's all about showing up and trying again. Even if I don't know if anyone will ever read it. Even when I have hundreds of other thoughts swirling around in my head that threaten to paralyze me with their urgency. Even if I think I shouldn't be the person doing this. There are better writers, more experienced beautiful people who have words, and thoughts, and studios and coffee shops. Brave is about showing up and watching the sun brighten the sky and getting back to work. you are brave and awesome! Love you! Awesome REAL inspiration. 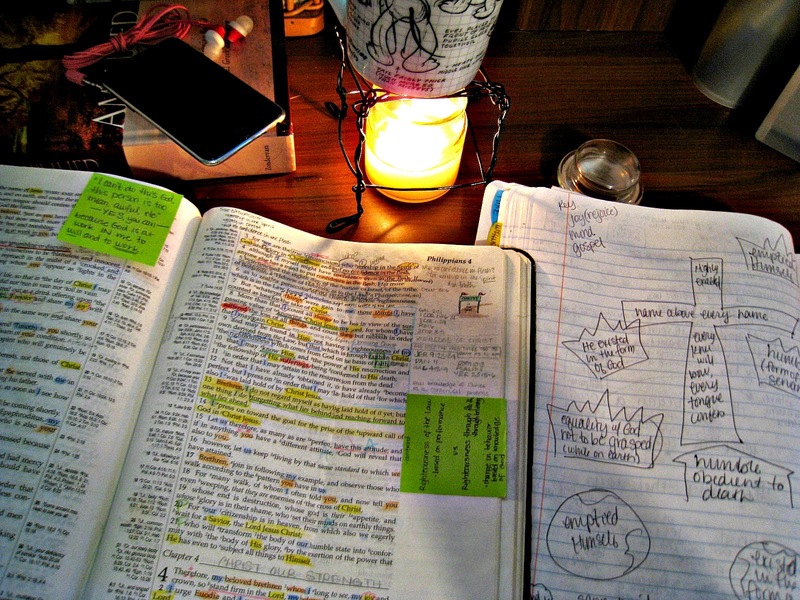 I love this picture of your Bible! It looks ALIVE! I'm always so hesitant to write in my Bible, but when I do, I love coming across my tentative little notes later. It reminds me of that earlier learning and it connects it to what I'm learning now. I'd love to see more about how you're marking in yours with the highlighting etc.